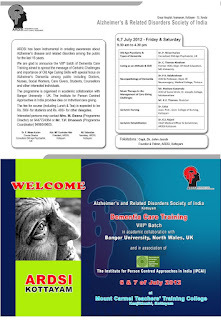 Alzheimer's Disease in India: Dementia Care Training, 6th-7th July 2012, Kerala. 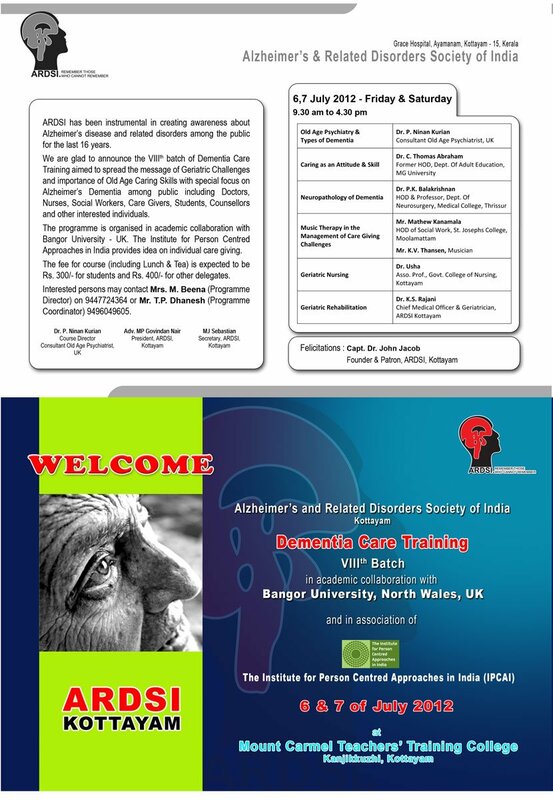 Dementia Care Training, 6th-7th July 2012, Kerala. Dementia Care Training in Kottayam , Kerala July 2012: ARDSI Kottayam Chapter is organising the 6th batch of "Dementia Care Training" in collaboration with Bangor University, North Wales, UK in association with The institute for person centred Approaches in India on 6th and 7th July, 2012 at Mount Carmel Teachers' Training College, Kanjikkuzhi, Kottayam. Herewith attached the invitation of the programme.